Renowned for having some of the largest accommodations in New York City, the revamped rooms in tones of whites, and pale beige and complemented by contemporary wooden furnishings provide an uplifting experience with brand new fittings, carpeting, oversized state-of-the-art HD Televisions and rejuvenated bathrooms. Yet these rooms will maintain their authenticity with many of the original elements brought back to life. Spacious elevator landings on each guest room floor will be re-imagined, offering a convenient lounge and work space, befitted with artisan designed communal tables crafted from reclaimed materials. Hotel Pennsylvania’s spectacular suites, featuring incredible views of the city, will also undergo renovations with specialized updates to be announced in the months to come. 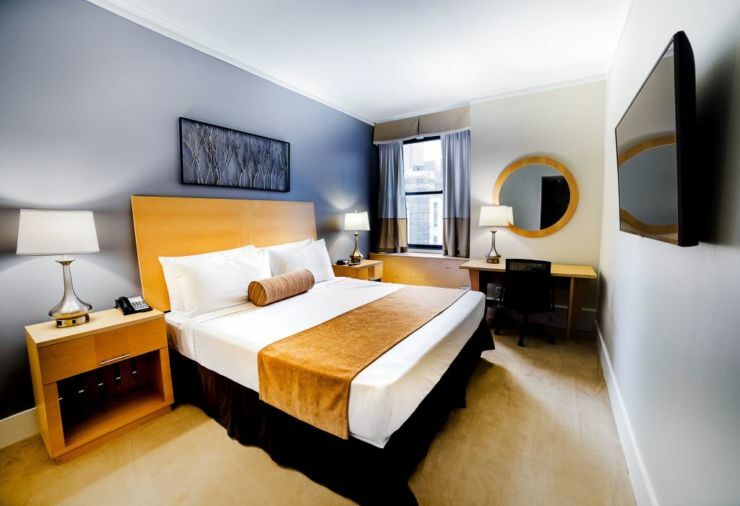 Often chosen for its prime Midtown location, Hotel Penn, as the hotel is often known, is just across the street from the iconic Madison Square Garden venue and a block from shopping mecca Macy’s, the world’s largest store. Also directly across the street is the hotel’s original neighbor, Pennsylvania Station, the busiest railroad station in the Western Hemisphere. The Empire State Building, Times Square and the new grand mall at Hudson Yards, are within close proximity. Known for offering one of the best values in Manhattan, based upon the average size of guest rooms and central location, Hotel Pennsylvania began its refurbishment project to ensure a modern, comfortable experience for guests for many more years to come. “It’s incredibly exciting to take such major steps to improve our overall guest experience as we enter into our 100 year anniversary” said Gene Nicotra, Vice President and General Manager of Hotel Pennsylvania. “This modernization is a firm commitment to our community and to our valued guests, addressing much of the feedback we have received from them through the years. This investment will return Hotel Penn to a hallmark and celebrated treasure of New York City’s rich history. To match Hotel Pennsylvania’s renewed commitment to providing its guests with unparalleled hospitality, their website is undergoing a full upgrade as well and will launch on April 23. The new rooms and suites will also be introduced on April 1, 2019 with a special 30% off promotion for guests to enjoy.